Hamilton acquired the Swiss manufacturer, Buren in the mid-1960's and around that same time Hamilton started using Buren's movements in the "thin-related" watches. This included the Thinline models and the Thin-o-Matics. Other Swiss-makers were used too but Buren movements were used predominantly - especially in the Thin-o-Matics. One of the Buren-based models is the TM-6800. It was introduced only in the 1968/69 catalog. The TM-6800 comes in a single-piece 10K RGP case that opens through the crystal. Tucked inside is a Hamilton 628 movement, which is a micro-rotor movement from Buren. This movement has a beat rate of 6 beats per second, or 19,600 beats per hour, as opposed to the typical 18,000 BPH rate in most vintage watches. I recently acquired a TM-6800 project watch that came on an interesting bracelet. It sort of matches the catalog but it's not an exact match, so I don't know if it's original but it's surely from the same period. These micro-rotor movements have a gazillion tiny parts in them and I really don't like working on them. So I sent this one out for service rather than risk screwing it up myself. Oddly enough, someone had installed the wrong sized rotor (oscillating weight) and I had to replace it with the correct one (shown below). And here's the finished watch, on it's pillow shot. It's a sharp-looking watch and lives up to it's aspiration to be thin. It's definitely very thin for a self-winding watch and more along the lines of a manual winder. Where can I get a Hamilton Thin-O-Matic dial refinished just like new and three missing spears between the alternate numbers replaced? Or, is there a supply of New Old Stock dials available? Getting some dials refinished "just like new" can be very difficult... you need to get the correct finish applied (challenging when it's a radial finish), you need to get the EXACT printing applied using the correct font and size (including SWISS at the bottom), and you need the correct matching markers applied. That's a big ask to get all three done well. I'd suggest you send an email to International Dial (www.internationaldialco.com) or Kirk Rich Dial (www.krdial.com) and see what they say. You could also keep an eye on eBay for a better example to come up - either attached to a parts movement or on it's own. You never know... eventually one will turn up. You mention that the case opens through the crystal, do you use a standard claw tool that removes the crystal? Any competent watchmaker could look at the watch and tell you what it needs. There are no "authorized" Hamilton watch repairers for vintage watches... only for modern watches. The fact that you have to take a modern Hamilton to an "authorized" Hamilton repairer is actually a shame and viewed by many as anti-competitive or a violation of fair trade principles. Anyway, the jeweler's observation that "the balance was off" doesn't make sense to me. Maybe they meant your rotor is missing (off)... that could certainly be the case as I've seen that before. Micro-rotor automatics are rumored to be under-powered from an auto-winding standpoint but remember you can still wind them by hand. 15-20 turns of the crown will keep the watch running 30+ hours for sure. I'd recommend you checkout the AWCI.com website and look for registered watchmakers in your area. Then call them and see what they say. Or shoot me an email and I can refer you to a couple of watchmakers who I know and trust. 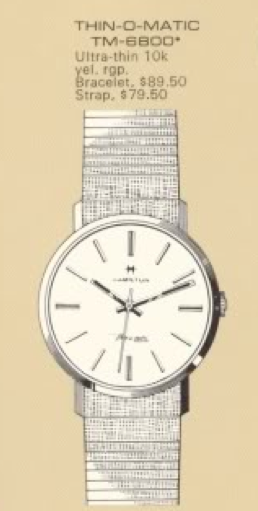 I went on theAWCI web site and could not find a watchmaker to service my watch. Can you send me a name of a watchmaker so I can get my watch running again to wear it proudly? Thank you. James O. Poag jewellers in Strathroy Ontario Canada will service the thin-o-matics. Hi, I have a thin-o-matic that has the word "Masterpiece" written directly under the Hamilton. Any idea when this feature was added to the Thin line? The online 62-63 catalog doesn't show this for any of the Thins that year. Otherwise the dial looks like a T-201. One other question, on the case back is the letter "J" with a line through it, next to the 14k imprint, same size font. Any guess on the "J" meaning? The word "Masterpiece" on the dial indicates that it's an Awards Division watch. The awards division provided special models to companies to use as service awards, recognition, etc. The models were intended to be "unique" and would not be found in your local jewelry store. As a result, the models could either be combinations to current models (same dial, different case, etc) or they could be discontinued models (a 1961 award using a 1955 model, etc). As an example, I've seen what looks like T-201 dial with a T-202 case (or vice versa, I forget which was which). That may be what you have. The "J" stands for Jonell Watch Case Company. Normally it's a J with an arrow or something like that. Hello, I just picked up a Hamilton thin-o-matic with a 628 micro-rotor for $75. Unfortunately it's missing a lug. The disk and movement are in excellent condition. I would love to recase the movement but can not find a case anywhere. Can you help me find a source? Gold, gold plated, or stainless anything. The most likely way to use your movement is to find another TM model. These movements are notorious for non-moving hour and minute hands (thanks to the offset center wheel / cannon pinion design). So your movement can either repair that watch or that watch can receive your movement and dial. Probably the former as the dial may or may not fit correctly.